A CD jukebox with a narrow depth! A superb relation to the Sound Leisure SL15 CD Jukebox - however in a more compact cabinet for those with space concerns! The Sound Leisure SL1015 Slimline is a compact version of the Sound Leisure SL15, complete with all the same features and build quality, but with a reduced cabinet depth of just 42cm meaning this incredible jukebox can be put in almost any room! 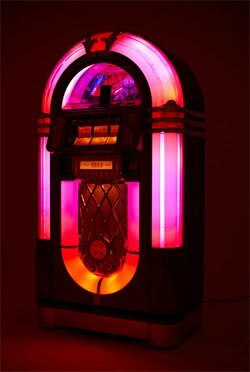 This is perfect for anyone who has always wanted to own a jukebox, but has been concerned at how much space they have for it. 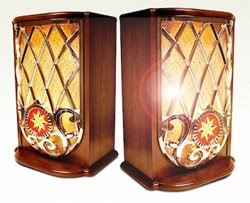 The design of the SL15 has been chosen to resemble the classic 1946 Wurlitzer 1015 - one of the most popular jukeboxes ever manufactured. The Sound Leisure SL15 Slimline is a brand new jukebox that holds 80 CDs and features beautiful bubble tubes, an aluminium-cast speaker grill and chromed base - a look that incorporates all the skills of a UK based workshop to bring you the very best quality. 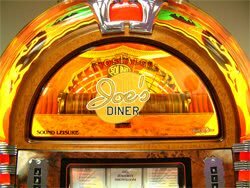 I'm loving my new Jukebox! Its worth every penny. Had the family round this weekend and we all enjoyed using the Bluetooth which was hooked up to Amazon Alexa...plenty of reminiscing! Such a beautiful looking machine and so very well made. Thank you Sound Leisure...will be sure to recommend you to all my friends and family! !